FootyFair’s Pedro and Steve did a great job describing in their “My First Live Football Match” their first live football experience in Portugal. But while their first live match involved giant European football clubs, mine was nowhere near the events they attended. For one, my first stadium experience was in Israel where I lived through my childhood and early teenage years. But also on that day in 1994, my favorite Israeli side Hapoel Tel-Aviv did not play against a giant team like Benfica or Parma, but rather against a club that actually no longer exists. Nonetheless, nobody forgets their first live match experience and neither have I, because that fixture holds a very special place in my heart. By the time 1994 had rolled around I was already 10 years old and wasn’t only playing football, but had been religiously watching the domestic league and other European competitions in the capacity of a true football fanatic. 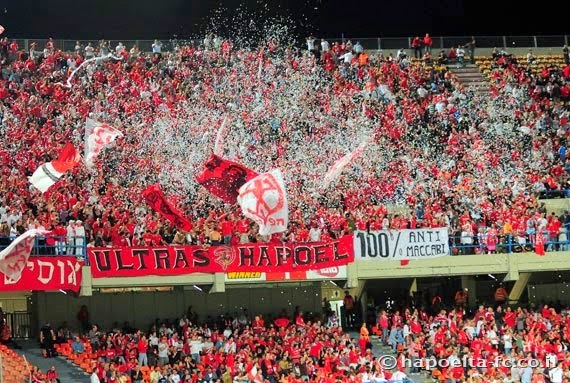 With my parents’ financial instability however, it was unthinkable for me to attend my favorite team’s games (Hapoel Tel-Aviv) at their stadium, which on top of all other obstacles was in another town. I had been to a few local third tier matches before that year, mainly because they were free for us to enter, but I will never consider any of those to be my “first live experience” as we were there more for our own entertainment value, rather than to watch the match. That year however, everything I thought I knew about the game would change in a span of two hours. As I was playing football in the yard in front of my building, my mother called for me from the window. For those of you who have experienced that feeling before, you know that usually it’s for a totally pointless reason like to eat or do your homework, but on this day it was different. One of our neighbours was over at our house and my mother introduced me to this odd looking “manly” woman. “I always see you play football” she said to me, and then proceeded to tell me that she was a player on the women’s team for my beloved club. First, my brain started to wonder about whether she was joking or not, because at that age I have never seen women kick around a football. But when she told me that she would like to take me to Bloomfield Stadium to watch a (men’s) Hapoel Tel-Aviv match, I couldn’t care less if she was a woman pope, I was all-in and had begun counting the seconds to the upcoming Saturday. When we arrived to the stadium it was like Disneyland, only without all the creepy cartoon characters. The woman, whose name I’m embarrassed not to remember, got me an Hapoel training shirt, just like the one the players wore in warm-ups, I felt special. We sat right in the middle of the field, she shook hands with all kinds of important looking people, but I could do nothing more than stare at my idols who were running through their pre-game programs on the pitch. The opponents on the day were Hapoel Beit-She’an who had just been promoted to the top tier the previous season and eventually folded in 2006, needless to say, a boring opposition. And although the final score was a dull 0-0 draw, for me that day was the best match I ever witnessed. The supporters were like family, greeting each other as they entered. The atmosphere was electric, and even though it felt like it was close to 40 degrees Celsius that day, the fans were on their feet, singing in one voice until the very last minute of the match. This was the day I fell in love with Bloomfield Stadium and reignited my lifelong passion with Israel’s Red Devils, Hapoel Tel Aviv.